Kawasaki started production of parts for the Z900-A4 in mid 1975 ready for the 1976 model year. The '4' of the A4 signified the fourth production year of the 903cc series. Kawasaki was the first Japanese motorcycle manufacturer to set up a manufacturing plant in the USA. 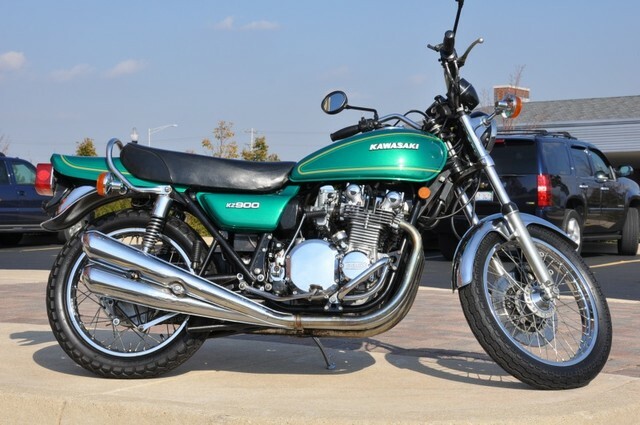 This plant was in Lincoln, Nebraska and the first Kawasaki to be assembled there was the KZ400 twin. Kawasaki exported parts from Japan to the USA and the assembly of the American model KZ900-A4 started at the Lincoln plant in June 1975. The 1976 model Kawasaki Z900-A4 for the UK and European market was first produced in October 1975. The Z900-A4 and KZ900-A4 were badged as Z900 and KZ900 respectively. With the introduction of the Z900, although the basic shape remained the same as the Z1 models, there were several styling changes along with some important mechanical improvements. The engine of the Z900 was produced in a bare aluminium finish as with the Z1A and Z1B, however redesigned and smaller 26mm Mikuni carburettors were used in an effort to improve mid range rideability. This did reduce the maximum power to 81 bhp and the top speed slightly in comparison to the earlier Z1 models. The electrical system was redesigned and now featured a three way fuse system. The turn signal indicators featured an audible tone, however many owners thought this to be an embarrassment and disconnected it. There was a Hazard Warning Lights feature with the switch fitted to the handlebar below the tachometer. The frame was now manufactured using thicker walled tubing to reduce flexing in order to improve handling. The front forks were also redesigned. The reflectors previously fitted to the front fork legs of US variants of the Z1 were now relocated to each side of the frame just below the front of the fuel tank. Twin front disc brakes with newly designed calipers were standard. The American KZ900 only had a single disc brake on the left hand side with twin discs as an option. The front wheel hub was redesigned and was no longer painted black. The rear drum brake remained on all models. The new larger fuel tank featured a locking fuel cap. The Z900 was produced in two completely new colour schemes: Diamond Dark Green and Diamond Brown. 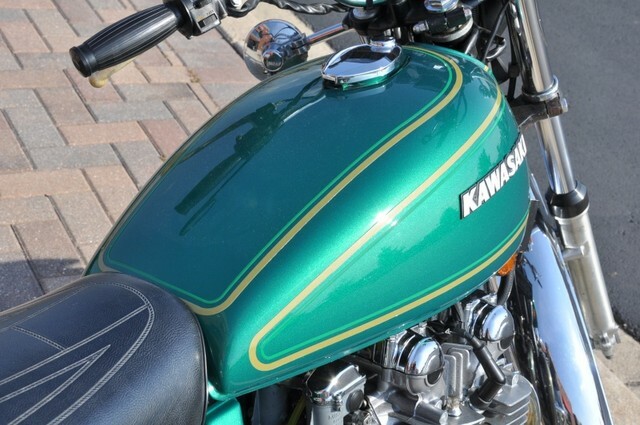 The Diamond Dark Green version had gold and light green pinstripes on both sides and the top of the fuel tank. The Diamond Brown version had gold and red pinstripes. Although much thinner than the stripes on the original Z1, the pinstripes on the Z900 tailpiece followed a similar pattern to the Z1 in that they ran along the bottom edge of each side of the tailpiece and then curved up and over the top at the rear to meet in the middle. 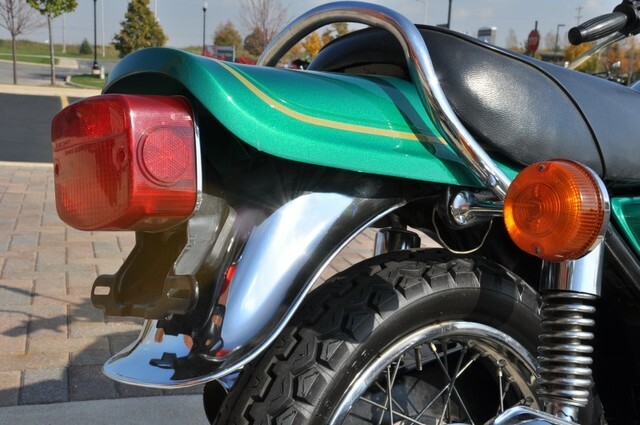 The tailpiece itself was now a different shape at the rear as it now housed a "squared off" tail light. The tail light on US models featured a reflector on each side. The reflectors that had previously been featured on the outsides of the rear shock absorbers on all US variants of the Z1 were therefore no longer required. The passenger grab rail on US models was similar to the ones fitted to earlier Z1 models and the rear turn signals were fitted to the frame, however the UK model had brackets welded to the grab rail to which the indicators were fitted. As usual, the side panels were finished in the base colour. The shape of the side panels had now altered to accomodate the larger airbox. The design of the side panel badges was also changed. The DOUBLE OVERHEAD CAMSHAFT legend was no longer present. 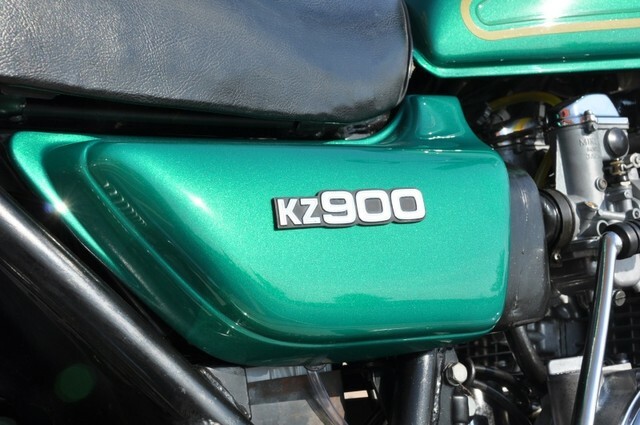 The badge merely stated Z900 or KZ900 in the U.S.A. Each letter and number of the badge was in white with a chrome surround and set on a black backplate. The letters were slightly smaller than the numbers. The instruments of the Z900 were redesigned with a more modern look to the console between the speedometer and the tachometer. The STOP LAMP feature was relocated from the tachometer to the centre console which featured warning lights from top to bottom for NEUTRAL, HIGH BEAM, OIL and STOP LAMP. Left and right turn signal lamps were positioned either side of the ignition key. As with the Z1B, the speedometer was calibrated to 240 kph and 20 kilometer increments. 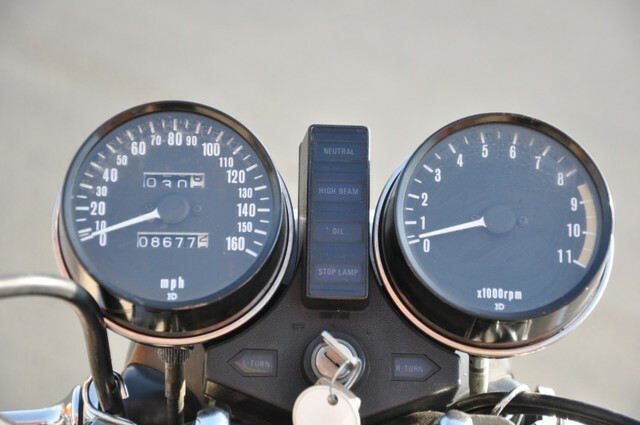 The Z900 / KZ900 tachometer was calibrated to 12000rpm with the redline starting at 9000rpm.